Abstract: I will first survey what is known as the Eratosthenes sieve, an empirical procedure to list the primes up to a given bound. 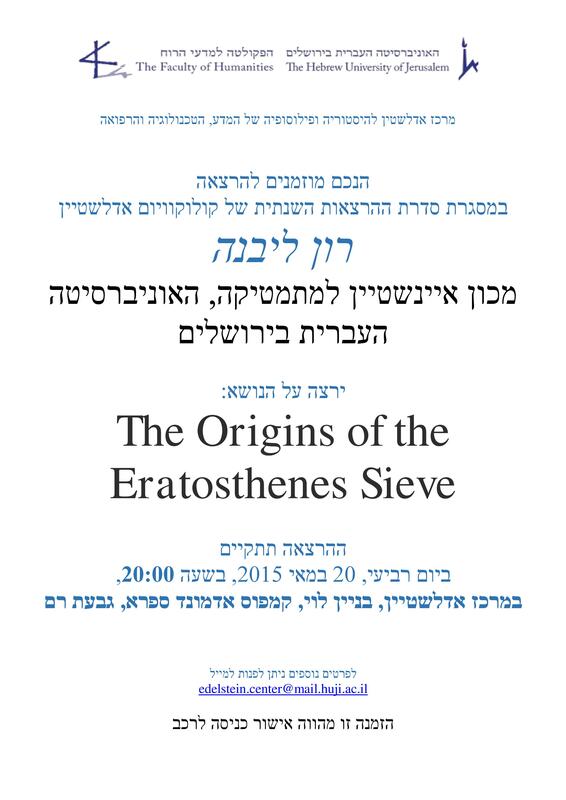 I will briefly describe the current state of the sieve today, from the point of view of the theory and of the implementation.Â I will then pass to the main part of the talk, the rather different procedure that the ancient source for the sieve, Nicomachus of Gerasa’s “Introduction to Arithmetic” actually gives. Eratosthenes gave a theoretic and empirical procedure to list (or count) the divisors of the odd numbers. I will comment on the terminology of the sieve and the Pythagorean classification of numbers. This terminology is very different from Euclid’s rational analog, in that it blends mathematics and mysticism.